From small to stately, different maple tree species (Acer spp.) grow in gardens in U.S. Department of Agriculture plant hardiness zones 2 through 9 with summer shade, brilliant fall leaves or strikingly textured and colored bark. Maple bark comes in a range of colors. Some varieties of Japanese maple (Acer palmatum, which grows in USDA zones 5b through 8), for example, have red, green or yellowish bark. Regardless of its color, when a maple's bark develops white spots, the tree may be fighting disease. Healthy maple bark has no spots or sunken areas. If white, pimplelike spots appear in sunken lesions on the bark of a maple's branches and stems, Valsa canker fungus has infected it. This disease -- also known as Cytospora canker -- usually affects branches less than 4 inches around. Most active in humid or rainy weather, the fungal spores attack bark wounded by pruning cuts or other mechanical injuries. 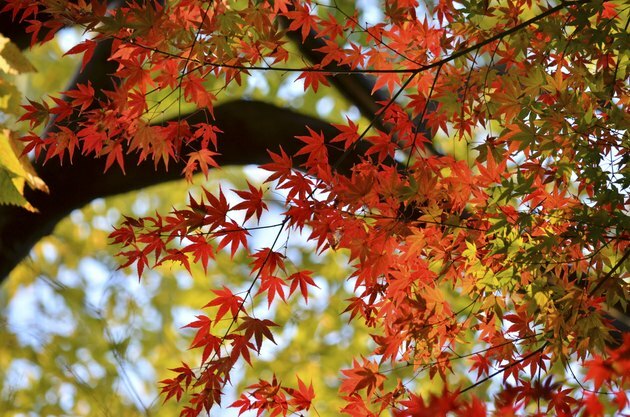 Maples are most susceptible during prolonged droughts or after extremely cold winters. While there's no cure for Valsa canker, keeping maples well watered in dry spells boosts their resistance. To stem the cankers' spread, prune infected branches immediately. Using clean, sharp pruning tools, cut them back to branch crotches at least 3 inches below the lowest cankers. To avoid spreading the fungus, disinfect your tools in isopropyl rubbing alcohol between cuts and after you finish. Seal the pruned branches in plastic bags and dispose of them. Like Valsa canker, slime flux is an incurable disease that enters maple trees through wounds. Once inside, it kills the wound-sealing cambium tissue directly under the damaged bark. Fluid draining, or fluxing, from the open wounds first blackens the bark, then dries to a whitish crust. Bacteria and other microscopic organisms feeding on the fluid give it an unpleasant, insect-attracting odor. The disease, also known as bacterial wetwood, weakens but rarely kills maples. Traditional -- but now discredited -- slime flux treatments included inserting iron drain pipes into the holes to channel the oozing fluid away from the trunks. According to Mississippi State University's Agricultural Experiment Station, these treatments cause deeper wounds that spread the infection. To control flux, prune all dead and weak branches, again disinfecting the tools between cuts. Shape bark wounds as they occur by trimming their damaged edges and loose bark with a sharp, clean knife until they resemble vertical, elongated ovals. The calluses that form around the trimmed edges compartmentalize the wounds and wall off the disease. Although maple bark spotted with white stain fungi may appear diseased, it's not. These white spots are Julella fallaciosa, the fungal stages of lichen waiting for algae to complete them. All lichens consist of green algae surrounded by sheltering fungi that nourish them with moisture and minerals extracted from the air. In return, the algae share their photosynthesized food with the fungi. Neither organism harms the maple in any way. What Are the Treatments for a Fungus in Evergreens?